The HP Slate 21 Pro All-in-One is a 21.5-inch touchscreen, Android-based PC with keyboard and mouse. It is supported with the Android 4.3 operating system and can access apps through Google Play. Quality and Effectiveness: The quality of the screen, with its 1920x1080 resolution and 21.5-inch touchscreen, offers a large and sharp view that is great for student projects. With Google Play, this opens the door for numerous educational applications for students and teachers to use in the classroom. The device comes with the Kingsoft Office application, which is compatible with Microsoft Office. This compatibility will make transitioning to Word documents and spreadsheets fairly easy. Ease of Use: The product is seamless. Just plug in, sign on, and go. With the keyboard and mouse, it functions as a general desktop with the added benefit of a touchscreen. With Google Drive, users can easily transfer information from different devices. Quick swiping on such a large screen and the ability to zoom in for more detailed imaging is a plus when working with artistic apps or maps. 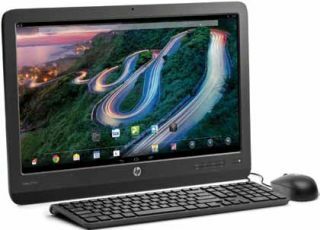 Creative Use of Technology: With its large 21.5-inch touchscreen and keyboard, HP Slate 21 Pro All-in-One is ideal for libraries, student labs, or as a classroom PC. Students can easily manage the programs with simple touches and swipes. Research comes alive with the vibrant colors on a high-resolution screen. Students can begin a project in the library or lab, go home or to the classroom, and continue working on the projects while accessing local and cloud-based apps. Suitability for Use in a School Environment: Given the quick “plug-and- play” atmosphere of the HP Slate 21 Pro and its low cost, schools can easily integrate the PCs into different instructional settings, such as libraries, computer labs, or classrooms. They could also be used as research kiosks in libraries. Students would be excited to use such a vibrant and fast PC that uses a Nvidia Tegra 4 quad-core processor. OVERALL RATING: With different types of computing devices being integrated into the classroom environment, the HP Slate 21 Pro All-in-One is an excellent product that will excite students. Students will not want to stop using it, because of the large touchscreen, quick access to Google Play, and the ability to view their own work through the cloud.